30 July : Congress chief Sonia Gandhi strongly backed Prime Minister Manmohan Singh on the issue of the Indo-Pak joint statement on Thursday and told party men that there should be no confusion or misunderstanding on it among them. 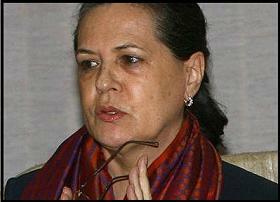 She also said that India’s foreign policy vis-à-vis Pakistan has not changed. “Till Pakistan shows concrete steps on anti-terror front there is no point of dialogue,” she told a Congress Parliamentary Party meeting in New Delhi, a day after the Prime Minister addressed Parliament on the issue of the joint statement with Pakistan in Egypt. Resumption of dialogue with Pakistan depends upon whether it fulfills its promises on taking action against perpetrators of Mumbai attacks and does not allow its soil to be used for terror activities against India, Congress spokesperson Manish Tewari quoted Gandhi as saying in the meeting. Those who attended the CPP meeting included the Prime Minister, Leader of the Lok Sabha Pranab Mukherjee, Cabinet ministers and over 200 MPs. At the meeting, Gandhi stressed on the need for fulfilling the commitments made by the party to the people during the elections. She also asked the ministers to give attention to the problems of party workers and the aspirations of the people in their constituencies.